Thought I'd post this for future reference. This is Tomato Spotted Wilt Virus (TSWV). Vectored by thrips, it is especially bad in the deep south. More links added for better reference. Click to see these. I think I'm seeing signs of TSWV on Lucky Cross and Coyote in my garden near Pittsboro. What a horrible disease! I want to be sure before yanking plants, so I may give them a few more days. So thrips don't respond to any sort of insecticide, eh? Is reflective mulch the only possible prevention? that looks like that ? Remove the entire plant immediately before thrips have a chance to spread it to your other tomato plants. Is this likely in Cincinnati? 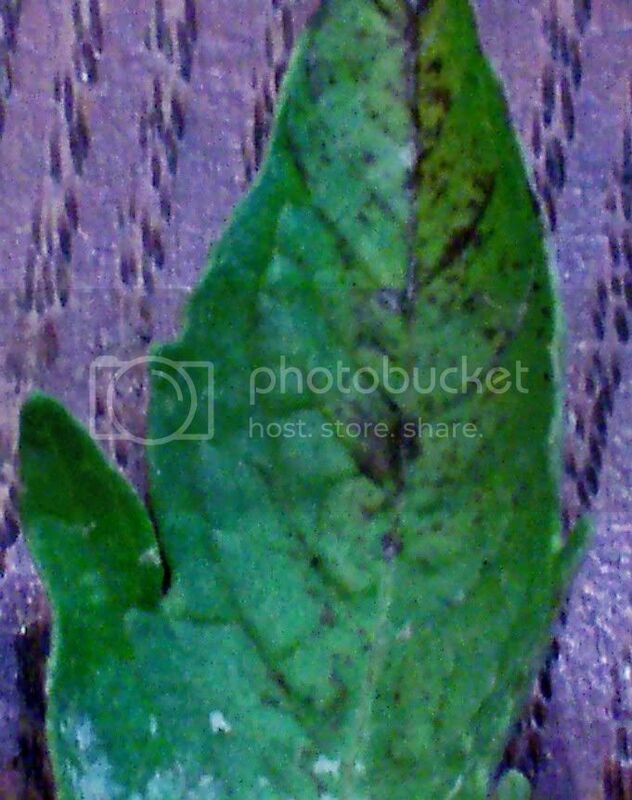 I'm seeing something that looks like this on several plants in one bed. They need to invent Tomato Inferon. My Giant Green Zebra is now infected...need to remove it tonight and see what else has been impacted. First time I've had it in my garden since 2002.....took a look at the Nine Dwarfs today, so far so good - though even if they do get it, I will keep the plants till they produce a ripe fruit, for seed (I've not seen it passed through seed - seed from the fruit from my 2002 infected Orange Heirloom produced healthy plants each year since). I just took my beloved Russian Chocolate out this morning ... R.I.P. It looked like a victim of TSWV judging from the pictures provided above. I pruned all the damaged foliage off this past weekend, but yesterday when I came home, it was infested to a greater degree than before ... I'll post my photos tomorrow or Monday. Anyway, if it's 180 miles down river here in Evansville, then I would think it may likely be in Cincinnati as well. A fellow tomato grower suggested lavender oil (10 to 12 drops diluted in water, in a medium-sized atomizer) sprayed on the plants every few days. (I don't know if her plants have TSWV, though.) She says she sees positive results. My Russian #117 got it! Tomato Spotted Wilt Virus caused by thrips. As soon as you have positive diagnosis, pull the plant immediately or other plants will get infected because of thrips. Hi, Patrina. So that old fashioned fly tape really works for thrips?? If it does, I'm trying it. I lost three quarters of my plants this season to TSWV even though I pulled them out quickly after it started to show. Thanks!